You know your sales goals – the new accounts you have to acquire and the revenue you have to generate. But how many leads do you have to generate to reach those goals? 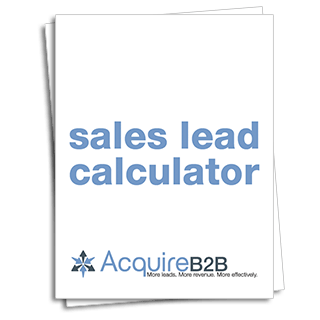 You could guess or you could be much more precise by calculating the actual number with AcquireB2B’s easy to use Sales Lead Calculator. The simple fill-in-the-blanks template represents decades of lead gen experience. Once you submit the information below, you can start entering numbers in the Calculator as soon as you download it.